1) The rotation of all the thirty antennas in AZIMUTH and ELEVATION thro' SERVO CONTROL COMPUTER(SCC). --> Using ABC - SERVO RS422 communication link @ 9.6 Kbps. 2) Alignment of the required feed for observation to the focus of the dish thro' Feed Position System(FPS). --> Using ABC - FPS RS485 communication link @ 9.6 Kbps. 3)Selection of FRONT END SYSTEM parameters like observing freq. band,Noise Cal,Channel Swap etc thro' MCM '5' & MCM - FE interface card in the Common Box. 5)Sets Baseband bandwidth (62.5 KHz to 16 MHz) using MCMs located in BASEBAND SYSTEM thro' Antcom '0' . 6)Monitors the C & M system parameters at Antenna shell using MCM '0' at NRR and at CEB using 6 MCMs thro' Antcom '31'. 7)Monitors the Temperature at various points in RFI cage in each antenna thro' Temperture Monitor system using MCM '0'. In addition, it also provides the vital voice communication link between CEB & all the Antennas.ie.You can contact anybody in any antenna using C & M SYSTEM. The communication medium is a single mode analog optical fibre link operating @ 1310 nm between CEB and all the antennas ie. two fibres are available for each antenna.So,the digital command & control signals are converted to analog form using non-coherent FSK techniques and sent alolng with the LO and IF signals.In the forward link,Telemetry command signals are combined with the LO carriers and transmitted to all the antennas and in the return link,Telemetry monitor signals are combined with the IF signals and brought to CEB.The FORWARD link uses 18 MHz carrier & the RETURN link uses 205.5 MHz . We'll see the system details later. The ONLINE SOFTWARE running on the UNIX workstation provides the user interface for sending all the USER COMMANDS like antenna postioning,setting various receiver parameters etc to different systems in MRR & all the ANTENNAS and displays the status of the same. Let us see how the user commands are processed by the ONLINE system. The user commands are formatted by UNIX workstation and sent to all the antennas thro' COMH at MRR & Antcom located in each of the antenna shell. More details will be given by Prof.A.P.Rao in his talk on "ONLINE SYSTEM FOR GMRT"
COMH is the main communication handler located at MRR C & M rack, handles all the packet communication between UNIX workstation and ANTCOM. COMH is operated in TDM mode ie. it sends the formatted user commnads to the first antenna in the subgroup & waits for the acknowledgement.If it receives the error free reply before the timeout period, then it accepts the data & selects the next antenna in sequence & the operation continues.But in case if it doen't get any reply before the timeout period or if the reception is erroneous then it tries three times and logs the error as Timeout or Checksum error and pass on this information to the ONLINE system for further action. ANTCOM is the vital Antenna base computer located in each of the antenna shells.It receives various parameters sent by COMH and performs all the tasks and passes the vital information to various systems like Servo Control Computer,MCMs and FPS thro' the following three communication links. 1)Main FSK communication link between COMH & ANTCOM at 250 Kbits/sec using OF system. 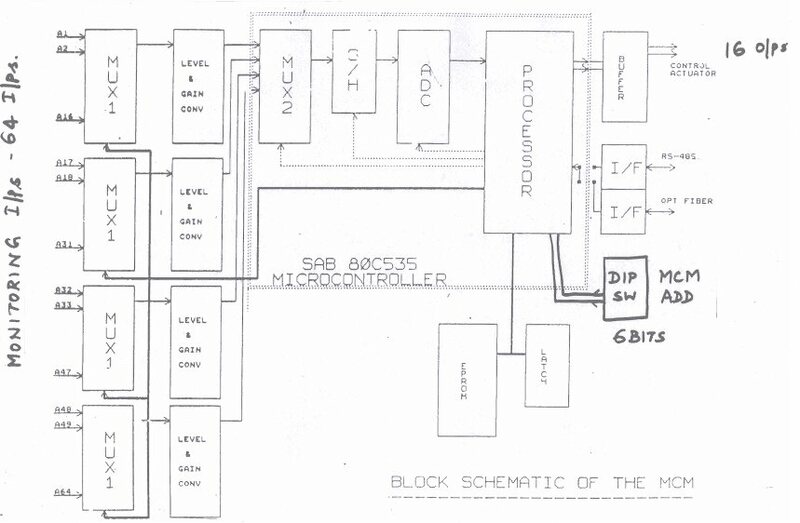 2)Asynchronous data communication link between ANTCOM & SERVO thro' RS 422 link. 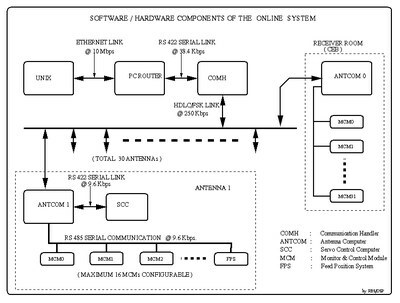 3)Asynchronous data communication link between ANTCOM & MCMs thro' RS 485 link. MCM is a general purpose Micro-controller based card which provides 16 TTL Control O/Ps and monitors 64 analog signals.Antcom communicates with MCMs thro' RS485 communication link @ 9.6 Kbaud rate and sets various FE,LO and IF system parameters. The Servo Control Computer located in each antenna shell accepts the movement command,position information etc. thro' Antcom-SCC link @ 9.6 Kbits/sec rate,validates the data and obeys the command.It returns the antenna status information periodically thro' the same link and will be displayed by the ONLINE software on the monitor. We'll see the specifications & the circuit details of COMH, ANTCOM & MCM later. Next we'll see the details of System Specifications and the various communication links used in the C & M system.